On our road trip last year we stayed one night in this beautiful state park in California. Prairie Creek Redwoods State Park is located north of Redwoods National Park and approximately a 50 mile drive from Eureka, CA. The campground is open year round and has 21 tent only and 43 standard campsites. You can reserve a campsite online via Reserve America – with rates about $35/night. The park itself had good access from Hwy 101. Larger RV’s can’t access most of the campsites but there are a few dedicated RV sites outside the main campground loop. 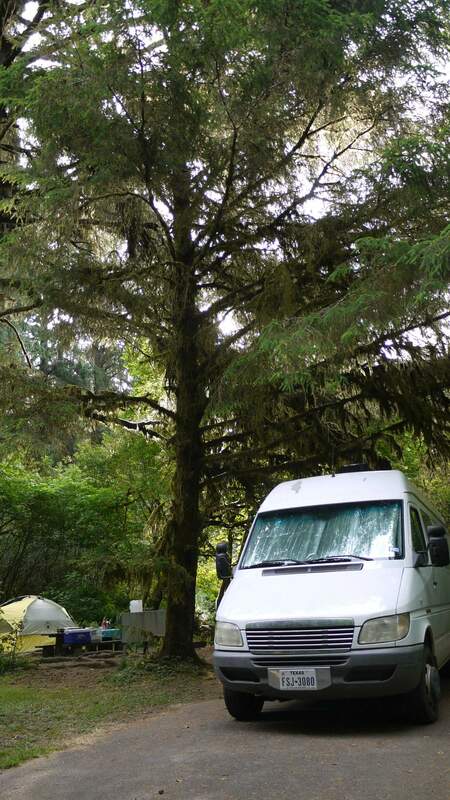 We didn’t have any problems maneuvering into our site on Elk Prairie Campground with our 24′ long Sprinter. Our campsite had a fire ring, a bear-resistant food locker as well as a picnic table and plenty of room for the Sprinter and a tent for the kids. There was enough space between the campsites so that you don’t sit on top of your neighbors. The campground has a lot of vegetation which makes it a bit dark during the day but you’re basically camping in a forest which is very nice. As usual in the state of California, don’t expect modern and up to date facilities. State park funding doesn’t seem to be a top priority there. However, what’s there is good enough to stay in this beautiful park for a couple of days: Clean flush toilets and hot showers. 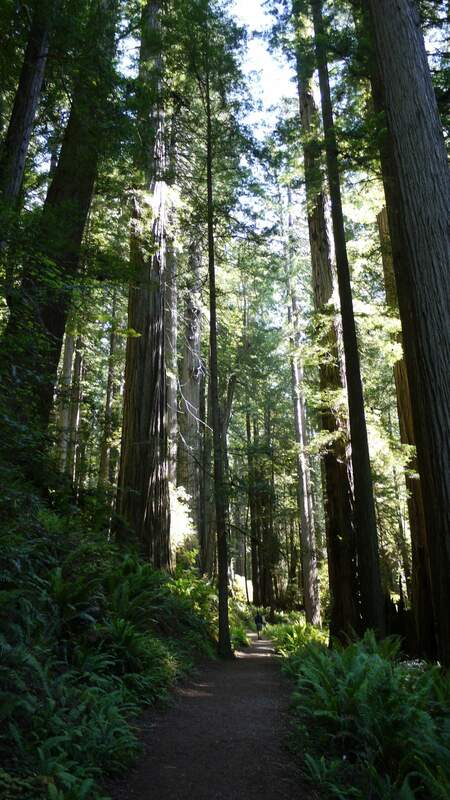 There are over 75 miles of trails in Prairie Creek Redwoods State Park. To see the most spectacular features of this park you’ll need to go on a Trail. Like Fern Canyon, a canyon with 50 ft walls, the gigantic Redwood trees or if you want to see the Pacific Ocean. Since we only stayed here one night we didn’t have enough time to go on one of the longer trails but there’s a great trail that starts next to the visitor center (about 3 miles round trip). If you plan to go to Redwoods National and State parks make sure to have more time and stay longer! We met very friendly park staff both at the check in booth and at the visitor center.